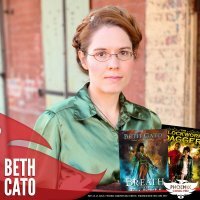 Nebula-nominated Beth Cato is the author of the Clockwork Dagger duology and the new Blood of Earth Trilogy from Harper Voyager. BREATH OF EARTH and CALL OF FIRE are out now, with ROAR OF SKY to be released in Fall 2018. Beth is a Hanford, California native transplanted to the Arizona desert, where she lives with her husband and son. Follow her at BethCato.com and on Twitter at @BethCato.